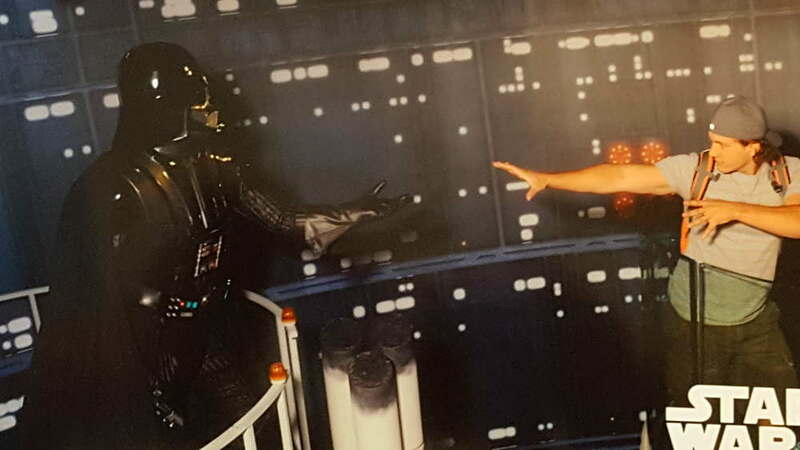 At Madame Tussauds (one of the most well-known wax museums in the world), Star Wars fans get to experience one of the most exciting exhibits London has to offer. After your museum walkthrough, and at the conclusion of MARVEL's 4-D movie experience, attendees are directed down a set of stairs to the Star Wars displays. As you descend, images on either side of the walkway reflect space-like environments-you really feel like you're in a space vessel! The Star Wars wax exhibits appeared to follow the chronology of the films, beginning with Episode 1: The Phantom Menace. Of all the scenes in the first film, the final battle between Darth Maul, Qui-Gon Jinn and Obi-Wan Kenobi is definitely the scene that sticks out to most fans as their favorite. Life-size wax figures of the three combatants with their lightsabers, inside Theed Palace, took the attention first as you completed your journey down the stairs. While Episode II: Attack of the Clones was not represented, Episode III: Revenge of the Sith was. Anakin Skywalker, or at this point Darth Vader, was the second exhibit fans reached on their adventure. This newly appointed Sith stood poised for battle in front of a backdrop resembling the blazing lava world of Mustafar. As guests proceeded past Skywalker, C-3PO and R2-D2 waited to great them. Lights in both droids impressed many of the attendees. This was a prime spot for photo ops as everyone loves the droids. Further on, a wax figure of Chewbacca offered his services as co-pilot of the Millennium Falcon to any fans who chose to sit in the cockpit. You really get a sense for how large this walking carpet is when he's next to you working at the controls. What happens when you push the red button? Go there and find out! What about Han Solo? Shouldn't he be flying the bucket of bolts? Not to worry! The smuggler can be found relaxing at the cantina. This is another great spot to "join the scene" by taking Greedo's spot opposite Solo. Following the Cantina experience, a pair of Imperial Stormtroopers stood guard. Although their shooting may not be the most impressive, these wax figures are incredible. Episode V: The Empire Strikes Back is a film that many people claim to be their favorite and this section definitely did not disappoint. Employees dressed as Jedi and equipped with cameras were stationed at two different locations throughout this segment of the exhibition. These Jedi photographers took pictures of you both in front of Yoda in a Dagobah scene as well as Darth Vader during the iconic "I am your father" scene. These photos were then available for purchase at the conclusion of the exhibit. Jabba the Hutt, Salacious Crumb and Princess Leia in her slave outfit were all very impressive. The Jabba's Palace Rancor pit grates are in front of the main wax pieces to add effect. This piece was taken from references from Skywalker Ranch. The area on Jabba's Throne, next to Leia's feet, was a popular place for fans to pose with the wax figures and snap a quick photo. One of the most unforgettable areas is the Emperor's Throne room. As you can see in the photos below, there is no Luke Skywalker. Usually Luke is there crossing blades with Vader, but at this particular time, he was probably being worked on. The biggest "eye-catcher" in the Sith Lord's throne was the detail on Palpatine's face. This area was large and was perfect for getting multiple people in a picture. Star Wars Episode VII: The Force Awakens was represented by one of the newest fan favorite characters- BB-8. The droid is positioned on an elevated piece of Jakku sand with a smaller depression for guests to take a seat and pose with BB-8. The round droid even made noises. This exhibition concluded the wax displays, but at Celebration London, it was revealed that a wax figure of Rey will be joining the group shortly. A Star Wars exhibit would not be a Star Wars exhibit without exclusive collectibles. As guests made their way through the Star Wars section, there were 3 stations where you could buy small coins depicting Star Wars characters. 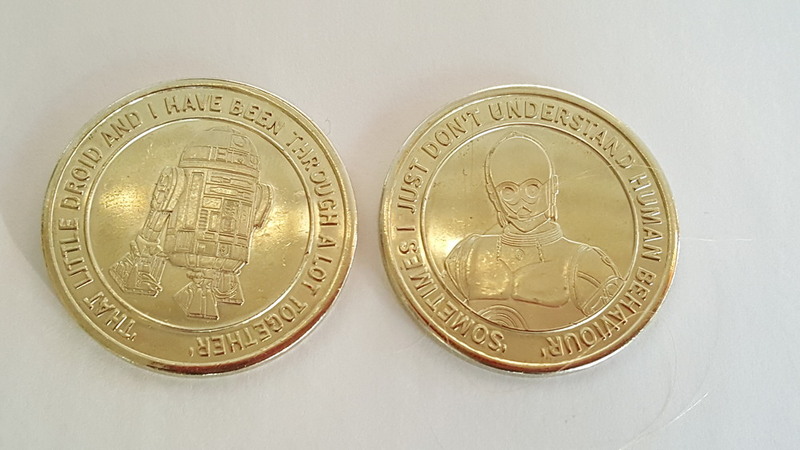 Coins of Yoda, Vader, BB-8, Kylo Ren, R2-D2 and C-3PO were available in coin dispensers for a few pounds each. The final stop on the journey through the Star Wars exhibition was the gift shop. Most of the items in the gift shop are licensed items which could be found in other places and weren't exclusive to Madam Tussaud's. Their collections of items for sale was fairly large, however, and items ranged from toys to remote controls, to t-shirts and books and everything in between. If you purchased from the Star Wars area, your items were placed in an exclusive Madame Tussaud's Star Wars plastic bag. This exhibition took over a year to complete with over 180 employees working on it and containing over seventeen different wax figures. If you're a Star Wars fan in the London area, you do not want to miss this!